Risk Management Seminar – Did you miss it? 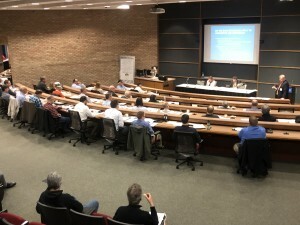 Last week at our 29th annual seminars in Grand Rapids, MI and Troy, MI we had over 60 firms join us!! Every year we are completely amazed and humbled by the incredible turnout. Our knowledgeable speakers came ready to share their expertise on relevant topics that relate to our design firms. While each speaker presented on their own topic thoroughly, it was great for the others to chime in to make it more of a discussion amongst our panel. And where else can you get free legal advice while earning free continuing education credits?! In the next week or so, look for the entire presentation to be on our website to view. You will also be able to download and print each speaker’s slides for reference or note taking while watching it. Although you won’t be able to earn the continuing education credits, you will have all the information available to you as if you were at our actual seminar! We have our seminars on DVD too! Send us a quick email to puimich@profunderwriters.com to request your complimentary copy. We also have prior year’s too, so be sure to include which year (or years) you would like.